Initial jobless claims dropped sharply last week, the Labor Department reports, but we’re still not out of the woods. The recent jump in new filings for jobless benefits went into reverse, but no one can ignore the still-elevated levels for this series. And until we see more reports like this morning’s, there’s going to be some awkward questions. 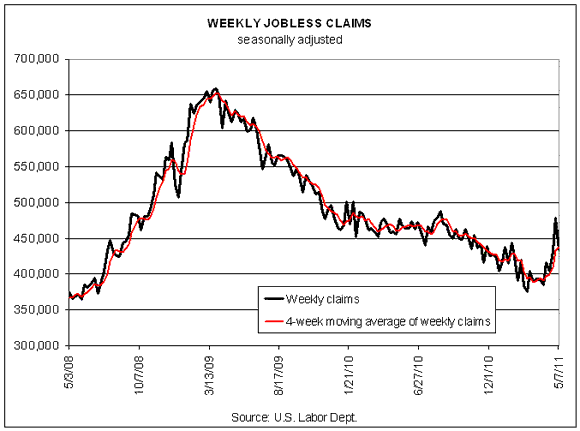 Seasonally adjusted claims fell last weekly by a hefty 44,000, pulling the total down to 434,000. That’s a big retreat, and a welcome one–just in the nick of time. But the trend still looks ugly and the tally remains well above the 400,000 mark. Indeed, the four-week moving average for new claims inched higher to over 436,000. That’s the third installment of a four-week average number above 400k and it brings us back to the trend level in February, when worries about the economic outlook were somewhat stronger. Today’s news that claims fell big time is surely encouraging. Anything less would have sent shivers down the crowd’s collective spine. But until (if?) we see more big retreats, and soon, the jury’s still out on what it all means. You don’t need much of an excuse these days to wonder about the prospects for economic growth and the biggest jump in jobless claims since the recession technically ended surely fits the bill. There’s probably enough forward momentum to keep everything humming, but even modest confidence doesn’t come easy. Yet with job growth in the private sector showing no signs of reversal last month, it’s not obvious that the trouble in jobless claims warrants broader concern for the labor market. That is, unless the recent pop in new claims has legs. For the moment, however, we dodged a bullet, even if the battle rages on. Yes, we’re back to the week-to-week nail-biting of reading jobless claims numbers to tell us how much optimism (if any) is appropriate. Back to the future. But don’t despair. Mass layoffs for this year’s first quarter also posted a sharp drop from the previous quarter and the year-earlier period too. The rise in jobless claims generally in recent weeks doesn’t seem to be infecting other reports in the labor market. Let’s hope it stays that way. But if we see another cockroach, the mood’s going to get a lot darker before it brightens.